Postcard from Howard Raybould to Miranda Neave featuring a landscape drawn in coloured pencil and black ink with the words 'Japan in the Rain May '81' written across the top of the card. 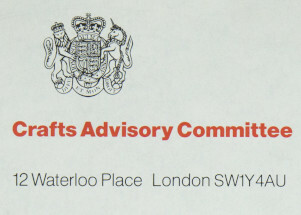 The handwritten note on the reverse concerns a suggested date for a meeting at the Crafts Council. Dated 23 May 1981, this postcard was made by Howard Raybould while on a Winston Churchill Fellowship trip to Japan.